Lacks gym/weight lifting experience – non-regular gym goers may ask this as they don’t know the name of any other exercises. Shows the askers immaturity – if you don’t believe me, note how often the bench press is the first thing all teenage boys seem to do first when they hit the free weight area. For some reason the bench press has developed a reputation of being the main measure of a persons strength, despite the fact that the bench press is focused on only working upper body strength. So when I was asked this question, by a young teenage relative at a wedding I couldn’t help but indulge. He looked blank for a moment, in only the way a 15 year old could as he thought through the question. I thought – sure you do…. He was a big lad, despite being younger he was already taller than me and I could see that he had the size to potentially lift heavier weight than me. But I simply dismissed this as childish, one upmanship posturing. “Do you squat?” I asked. I gave a sly smile at his response. I decided that this wasn’t really a discussion for me to promote the benefits of squatting, so I continued asking about other lifts. “How often do you go to the gym?” I asked. He thought through what I said, but before he could give a response I continued my counter attack. “You know.. my mates” he grunted with less confidence in his voice. “Why does that make a difference?” I continued to ask. “Well if they want to hang out and I say I’m going to the gym they’ll think I’m a loser” he said quite defensively. I laughed at the thought of kids hanging round on street corners having the nerve to think someone going to the gym is a loser, but I had experienced peer pressure myself in my youth, so I decided to ease off. 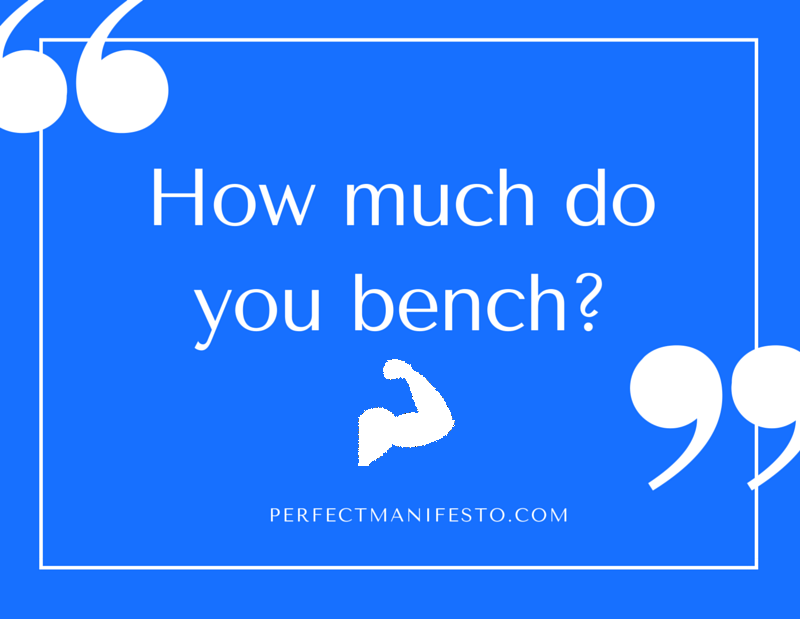 I think the main point of this story is not me putting someone who is half my age back in his place or that peer pressure stops us being better people; but that we need to stop thinking that the bench-press is the only thing in the gym. Perhaps we should start asking – How much do you train? Saying you benched 85kg once is okay, saying you can do it every week is much more impressive. How to answer the interview question – What is your weakness?